What happens, when you intend to knit a nice braid, but you work all cable crosses in the same direction by mistake? A new, ropey cable appears, so fun you’ll want to knit it on purpose! Mistake Braid socks are cushy cabled socks for snuggling in bed, lounging in front of the TV or curling up with a good book. Worked in worsted weight Calm from Dream in Color, they combine gorgeous colors with a functional, foot-hugging, comfortable construction. The mini-gusset and short row heel creates a nicely-contoured but easy-to-work heel. All-over ribbing complements the cable design and provides a snug fit. 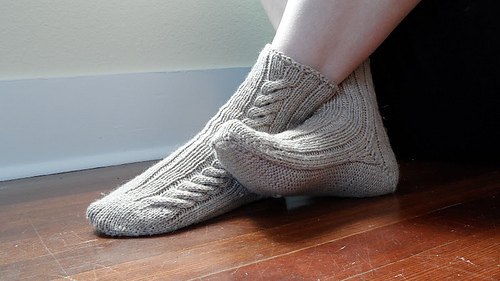 The sole is worked in reverse stockinette for maximum comfort - the worsted-size purl bumps are on the outside while the smooth side caresses the foot. This pattern also includes recipe-style instructions to work this pattern in Dream in Color Everlasting Sock.